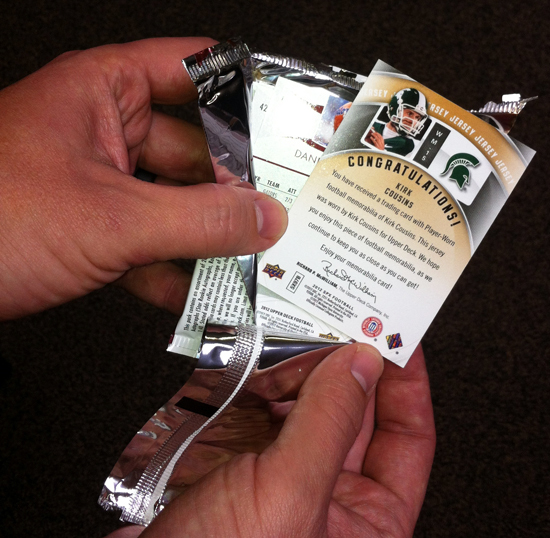 I’ve seen it happen thousands of times where a collector opens a pack of Upper Deck trading cards and discovers a card that looks a little different. 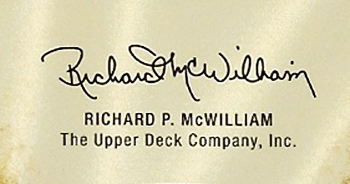 They quickly turn it over to see the legal copy on the back that starts with, “Congratulations!” The text after that describes the special collectible they have received and then they see the signature of Upper Deck’s co-founder and CEO; Richard P. McWilliam. They quickly scan back to the front of the card to admire the autograph or relic they have received and it is at this point I usually see their hands start to shake as they show it off to anyone and everyone around them. I often hear card collectors talking about who has the best signature. Is it Michael Jordan or perhaps Tiger Woods? For my money it has got to be Richard McWilliam. When you see his signature on the back of an Upper Deck card it means you received something special, rare and most importantly, authentic. The signature is also a classic. You will also find Richard’s signature on the certificates of authenticity for all of your Upper Deck Authenticated collectibles as well. And while a certificate of authenticity certainly is not as visually stunning as the UDA memorabilia pieces, it sure is an important component of them. 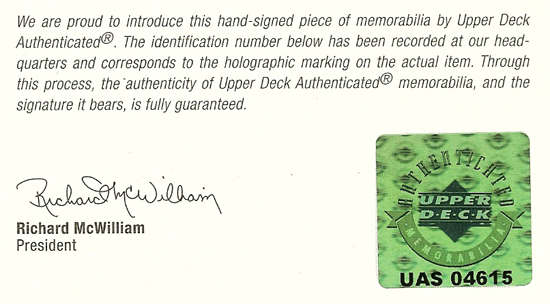 After all it was Richard’s vision that brought Upper Deck Authenticated’s patented five-step authentication process to the market which included that certificate of authenticity with his signature. In my time here at Upper Deck I would get a couple requests a year from collectors for Richard to sign a business card for fans and he would always oblige. And while we were deeply saddened by news of his passing this week, I find it uplifting that Richard’s signature will forever be tied to some of the most innovative and collectible items the sports collectibles market has ever seen. His name lives on in each of your collections. When you take time to admire your favorite autograph or memorabilia items in your collections, I hope you smile when you see his signature knowing he was a driving force for authentication and innovation in this industry. Internally staff here at Upper Deck knew a slightly different signature on items we would receive from time to time directly from Richard. It was a stylized “R,” that had the look of a figure 8. As an employee here when you received something with that shortened signature on it, you immediately took notice. I fondly recall the first time I received an item with this signature on it from Richard back in 1999 before the days of email. I had recently taken over the Customer Service Department and was working hard to provide updates of changes and improvements we were making. It came in an inter-office envelope and I was in awe that I had received any type of accolade from the man himself. I remember being very proud of it, so much so that I put it away and I was able to find as I went through some older files after hearing of his passing. This is a collectible I will always cherish. I can say with confidence that no man has challenged or motivated me like Richard McWilliam. I am a better person for having worked for him and remain motivated to see his life’s work continue on as are the rest of the staff here at Upper Deck. Thank you Richard. How true! Think of how many cards his signature has graced. Upper Deck, under his vision, completely revolutionized the sports card industry. It’s inaugural edition in 1989 raised the bar when it came to the standards of quality that each card product was to be held. It’s a fitting tribute to Mr. Mc.William’s visionary leadership that he continues to be a part of his company long after his days on Earth are done. Thanks for the article, Chris. Imagine the collecting world without Mr. McWilliams innovations. The creativity with cards, the stellar authentication of the greatest memorabilia in the world…..
Mr. McWilliams took the card industry from the cardboard days to the dynamic level that exists today, and Upper Deck’s influence in baseball and NFL and NBA products is sorely missed. We must all hope that Upper Deck stays strong and continues Mr. McWilliams legacy. Regardless, –he will be sorely missed. That is a very moving and accurate tribute. 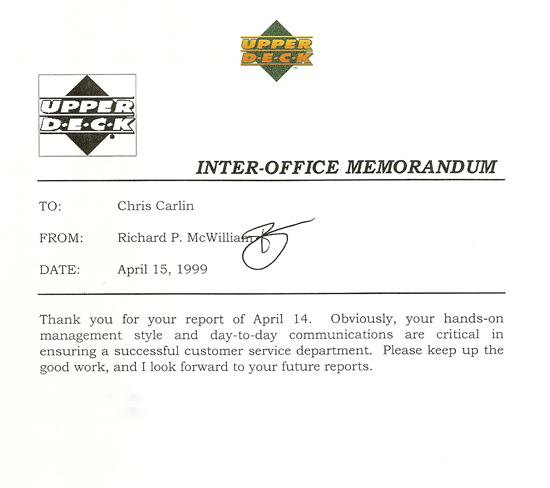 As with thousands of people, I had many incredible experiences and opportunities the 12 years I worked for UPPER DECK. Working at UPPER DECK, there was never a dull moment!! Thank you for reminding me and who knows how many others what we have to be thankful for.